German-American architect and engineer; born in Stadt-Lengsfeld, Saxe-Weimar-Eisenach, July 3, 1844; died in Chicago, April 15, 1900. 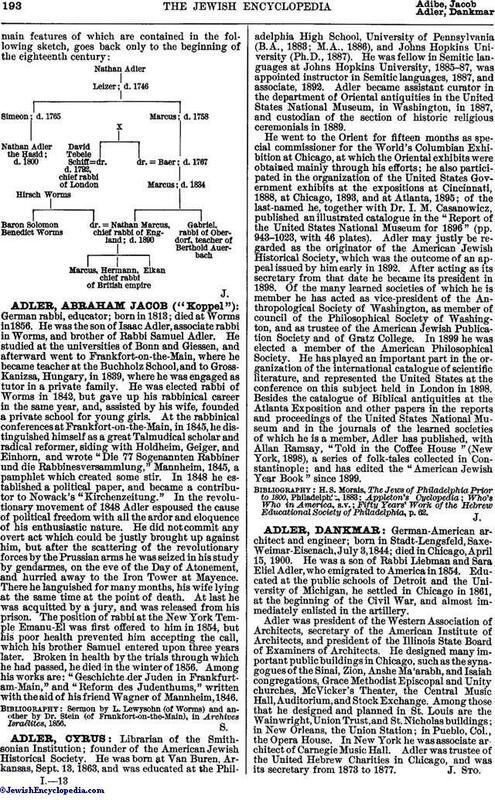 He was a son of Rabbi Liebman and Sara Eliel Adler, who emigrated to America in 1854. Educated at the public schools of Detroit and the University of Michigan, he settled in Chicago in 1861, at the beginning of the Civil War, and almost immediately enlisted in the artillery. Adler was president of the Western Association of Architects, secretary of the American Institute of Architects, and president of the Illinois State Board of Examiners of Architects. He designed many important public buildings in Chicago, such as the synagogues of the Sinai, Zion, Anshe Ma'arabh, and Isaiah congregations, Grace Methodist Episcopal and Unity churches, McVicker's Theater, the Central Music Hall, Auditorium, and Stock Exchange. Among those that he designed and planned in St. Louis are the Wainwright, Union Trust, and St. Nicholas buildings; in New Orleans, the Union Station; in Pueblo, Col., the Opera House. In New York he was associate architect of Carnegie Music Hall. Adler was trustee of the United Hebrew Charities in Chicago, and was its secretary from 1873 to 1877.